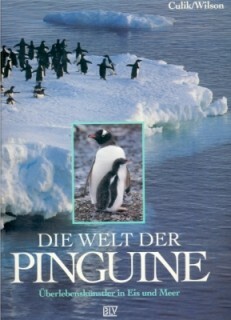 Most of the information and biokogy of penguins is based on the books "Was ist Was - Pinguine" and "Die Welt der Pinguine- Überlebenskünstler in Eis und Meer written by Prof. Boris Culik, who gave me permission to use them, for which I am very grateful. The second book was written in co-production with Rory Wilson, who too agreed that I could translate and use them. 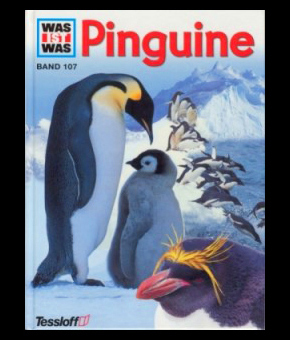 Secondly I want to thank Peter and Barbara Barham, who let me fill up some things with the help of their website, partly based on the book "The penguins" by Tony Williams. Dave Houston too helped me with some information, wherefor many thanks. The wildlife photographer Kevin Schafer was so friendly to let me use some of his beautiful pictures. Here too my special thanks. Of course all the "borrowed" pictures of other persons are marked with copyright. This counts too for the pictures borrowed from following people, who were so friendly to loan them to me: Elizabeth Burtt, Ingrid De Sloovere, Rutger Geerling, Dr. Knieriem, i-bird.com,Fritz Pölking, Julie Robinson, Armin Rose, Anneke VanderMeer, Arno Vlooswijk, Warner Bros, Rory Wilson, and some more. © 2001 - 2008 by Hedwig Reunes-Vanhaevre. All rights reserved. No part of this website may be reproduced, stored in a retrieval system, or published, in any form or by any means, without prior written permission of the publisher, Hedwig Reunes-Vanhaevre, Belgium. Since I collect penguins of all types, it just wouldn't seem right not to have a graphic collection! Along my journeys through penguin cyber-space I have found some very cute graphics that I just had to keep. As far as I know, the few I have "borrowed" and used here are free and the ones which are copyrighted are credited. There are also some original creations and some which I have found in my clip-art files. Enjoy them all, and if you would like to add the other graphics, which do not originate here, to your collection please contact the appropriate owner, remarked on the page. If there is a graphic that isn't credited and should be, please contact the webmaster, so the appropriate mention is given. But please respect others work and ask before using it on your own pages.